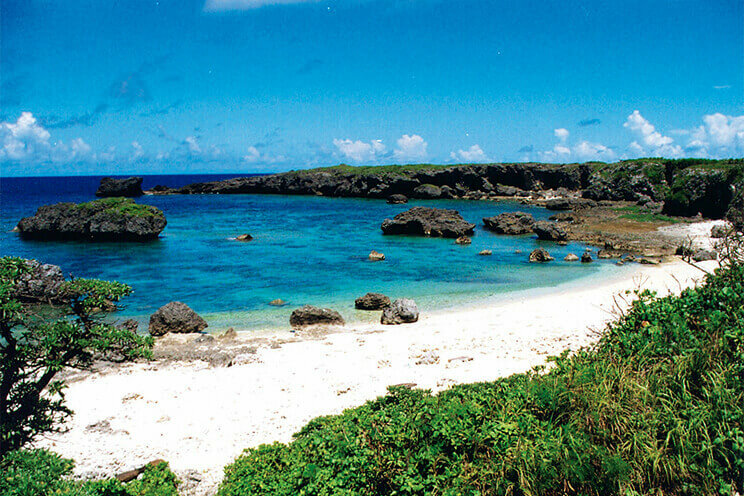 Shimoji Island is a small isolated island within the Miyako Islands, located to the northwest of Miyako Island. 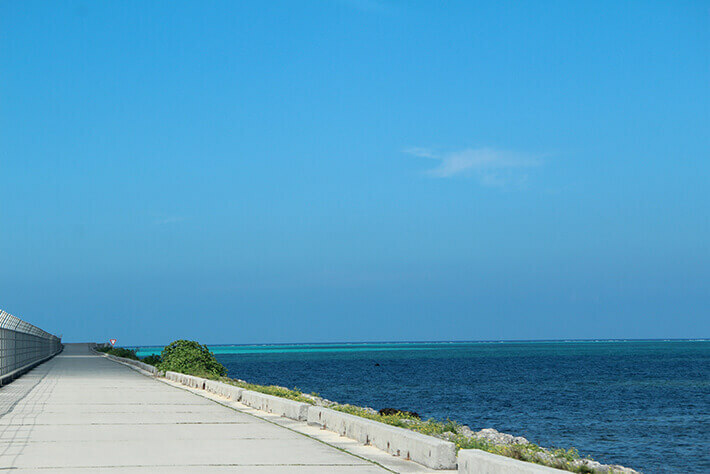 Because Miyako Island is connected to Irabu Island by way of the Irabu Bridge, it is possible to travel between the two islands by car. 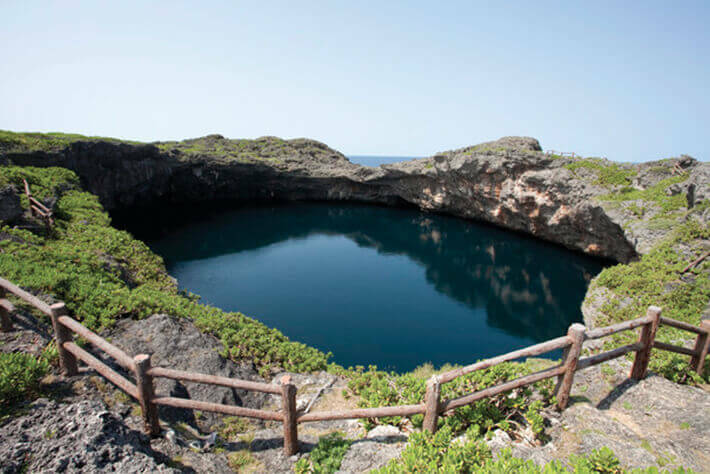 The sea surrounding Shimoji Island has a complex bathymetry, and is referred to as a mecca for cave diving. 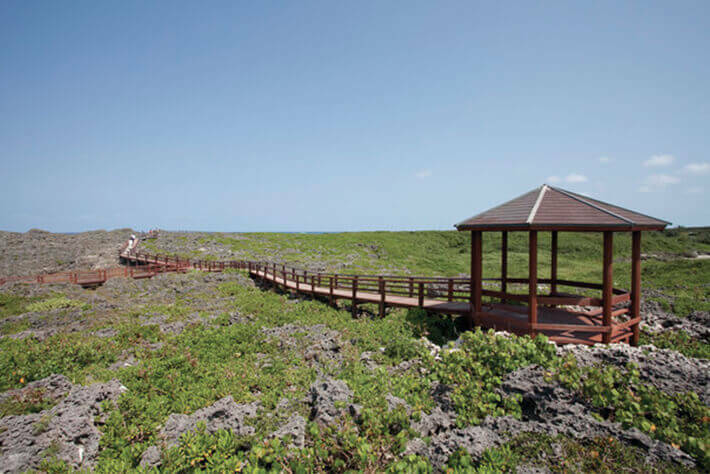 Most of the island is occupied by Shimoji Island Airport, which was built as for pilot training , and the so-called “17 End” extending from the northern end of the airport out into the sea is extremely popular for spectacular photo ops. 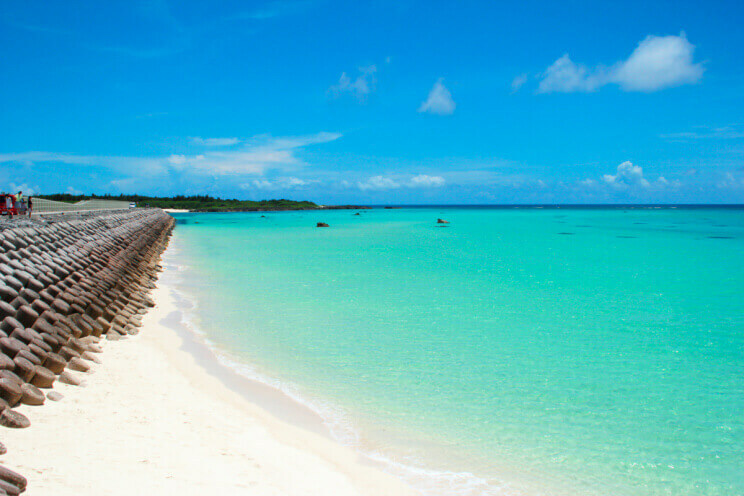 At the Sawada Lagoon in the western region of the island, you can see the remnants of a traditional fishing method using the ebbs and flows of tides known as “nagaki,” which involves underwater stone walls. Tooriike Pond was named for the fact that two ponds of almost identical size were found connected underwater. It has been designated by the national government as both a scenic location and natural monument for its extremely rare formations. 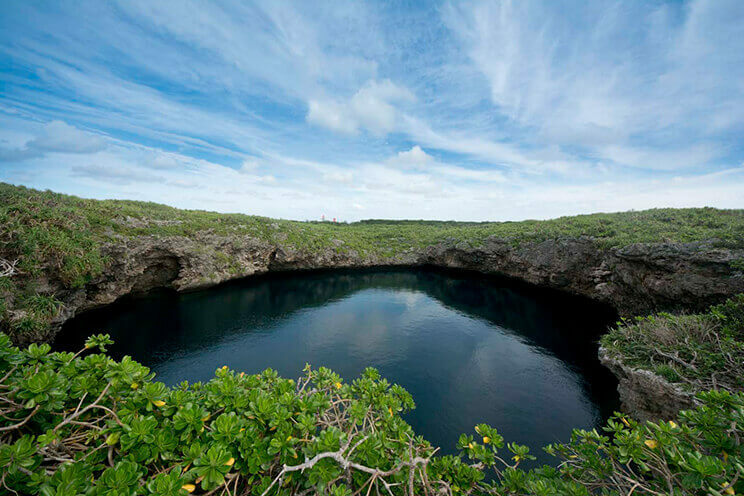 While one of the ponds connects underwater to the ocean, and divers can reach the surface from the pond by ocean, this diving spot requires advanced skill to swim through the dark underwater tunnel. Due to the difference in water depth, salt concentration and water temperature change drastically, and a wide variety of marine life inhabit the ponds. There are even a few legends that may be attributed to the mysterious sight. 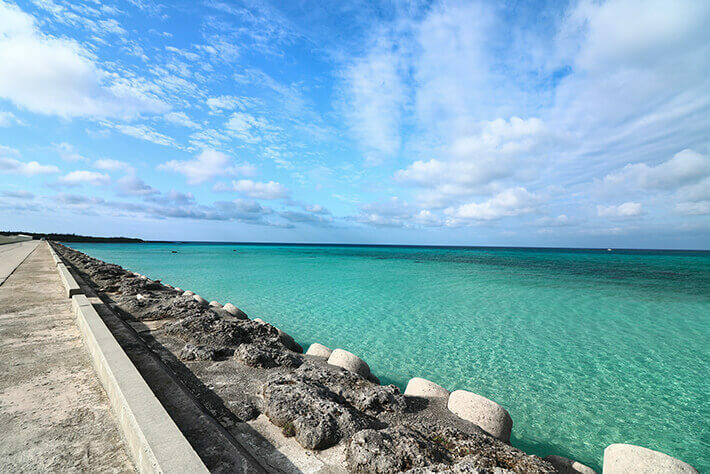 Nakanoshima Beach, known locally as Kayaffa Beach, located on the east and west coasts of the island along the outer road, is a beach surrounded by a massive reef with a calm bay that is not affected much by the outer sea. The waves are quiet and the water is highly transparent with various types of coral and tropical fish inhabiting the area. Since it is a natural beach with no lifeguards, you will need to be careful and watch over your own safety. Shimoji Island is famous for its runway at Shimoji Island Airport and the pier with guiding lights extending out to sea. 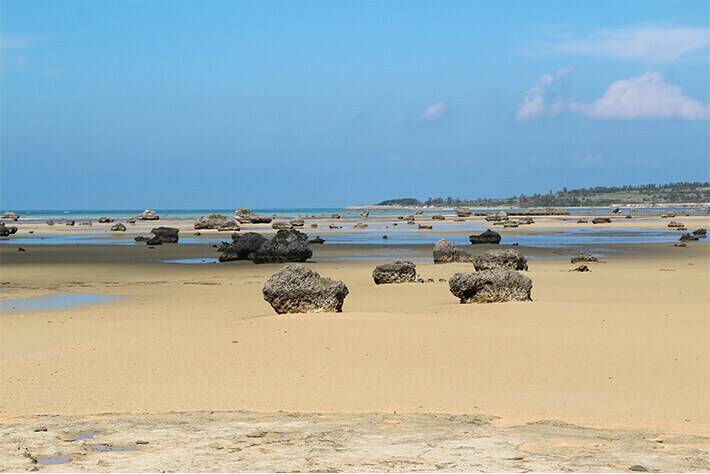 17 End refers to the angle at which the runway extends, and because the runway extends over the sea, part of the runway was reclaimed, changing the flow of the drift, causing sand to accumulate. The sand appears only at low tide, drawing much interest as a mystical beach. You will be taken in by the blue from the sky and sea. It is such a stunning sight that it will have you wishing you could enjoy it forever. No enhancement work has been carried out on the beach, so visitors are advised not to enter the area. Size / Population: 9.54km² / population of approx 35 people.